Every night at sundown, a Texas constable stops traffic and directs people's attention to an 83-year-old man standing on his balcony. Silence fills the streets as Galveston Constable Clint Wayne Brown motions for the man to begin. With his bugle raised, Marine veteran Guy Taylor begins to play "Taps." "It's like that cup of coffee every day -- you gotta have it every afternoon," Brown told CBS News. "You're hooked on it." The tradition started four years ago when Brown was downtown and heard the music playing. He followed the sound, which led him straight to Taylor, who was playing in honor of a fellow Marine who was killed during the Korean War. As a U.S. Navy Reserve, Brown instinctively looked up at Taylor and gave a salute. Meanwhile, people downtown continued to drive by and walk without pause. "I thought, 'No, that's not how this works," said Brown, shaking his head. Brown went back to his patrol car and shut the street down, forcing people to respect the historical tradition. The next day, Brown came back to the spot at sunset and did the same thing. Years later, it's now part of Brown's daily routine, and Taylor attracts crowds of up to 100 people. Local resident Karla Bruton Smith is one of those people. 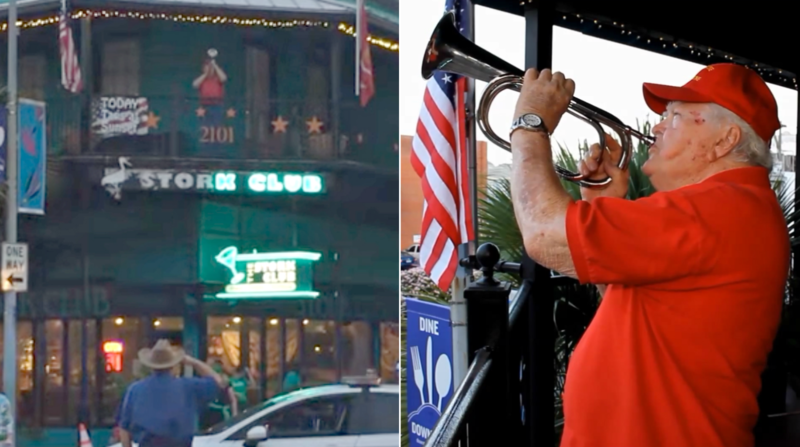 She was eating dinner with her husband across the street from Taylor's home when the restaurant owner asked if the couple wanted to hear "Taps." "We left dinner on table and went out on street and became part of the experience," Smith said. "It was so unique." Being a part of a family with military roots, Smith said she was touched by the man's actions and wanted others to witness it. So, she posted a video on Facebook, and it went viral -- with nearly 125,000 shares. "I think that hearing 'Taps' -- that final farewell song -- struck a chord with everybody," Smith said. "Every generation, whether you're younger or older, is impacted by someone in our country's involvement in the military combat." After seeing Smith's video, veterans from around the country have flocked to Post Office St. and 21st St. in Galveston to hear Taylor play. Smith was lucky enough to meet some of those heroes, who thanked her for sharing the video with the world. "I told them, 'I just took the video -- that's nothing,'" she said. "They told me, 'But it is, because you're getting the word out and making people realize.'" "I hope it lets people realize that this matters," Smith said. "We need to give respect to our veterans; they have all sacrificed so much."